H.C. Haynes, Inc. hires many highly trained and skilled independent subcontractors who use the latest equipment to harvest wood on public and private landowners as well as our own company lands. 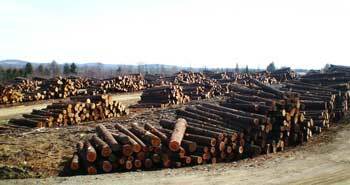 Many of our subcontractors are Master Loggers and most are Certified Logging Professionals. The marketing of wood products is an area we have successfully done since 1963. Our close relationships with the various mills throughout Maine and Canada and our ability to deliver the volumes when needed enable us to give high returns for wood products sold through our contracts. We also operate various concentration yards where we maximize the full end product value of each tree. H.C. Haynes, Inc. has a team of professional foresters to help private and public woodlot owners manage the harvest and sale of timber to meet their particular goals. From our ability to market in volume smaller woodlot owners have the advantage of being able to increase their returns. In October of 2010 H.C. Haynes, Inc. was certified as a FSC/SCS Chain-of-Custody company. This confirms we meet strict Forest Stewardship Council (FSC) standards in the title and control of our wood products. CLICK HERE to go to the FSC website.